I will be reading Tarot cards for brunch this Sunday, August 17th! Come and see me at Crush Bar from Noon until about 4pm. Crush Bar is located at 1400 SE Morrison Street in Portland, Oregon. They’ve got an amazing brunch menu and delicious drinks. Mention this post and I’ll give you 50% off your first reading! Don’t Forget: Wine and Tarot! Two events in one week might seem like a lot, but don’t forget that I’ll also be at Pairings Portland this Friday, August 15th, to pair Tarot cards with delicious wine. Read more about it! I’m really looking forward to seeing you soon! Great suffering for brief pleasure. I love this new deck! Before I get into the rather straightforward message of this card, please take a moment to look at the image and enjoy the great variety of imagery, both comic and macabre. There’s a man in this card who appears to be the main character. The top of his head has been removed and his brain appears to be flying away while he stumbles cluelessly, grinning like an idiot. In the background, a couple is cupcaking1 beneath a tree, while a card game has been interrupted by a man having chest pains. 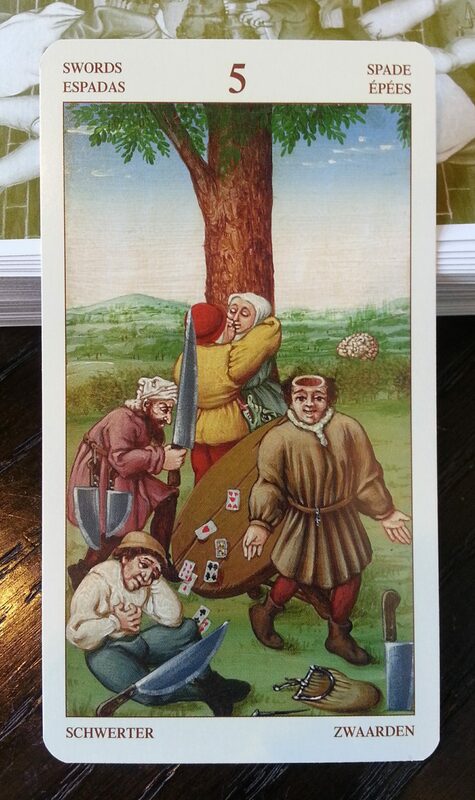 True to the classic imagery in this card, a sneaky ruffian is lurking with three of the swords. Oh, and look closer: Behind the upturned card table, some kind of green monster menaces the lovers beneath the tree! What does it all mean? This card shows lust, gambling, too much excitement, thievery, idiocy, and greed. These are all behaviors we engage in when we lack the foresight of prudence. Short-term pleasures need to be measured carefully. It is far too easy to indulge in them while forgetting their long-term consequences. The message of this particular card is pretty simple: Don’t trade in your long-term happiness for immediate pleasures. This is a card that urges you to plan for the future, to step cautiously, and to temper your pleasure-seeking in exchange for easier times to come. My apologies for the lateness of this post. I found myself in a place without Internet access and was unable to finish uploading what I had. How much should the client interpret the meaning of the cards? In other words, how much should the client decide what each card means for them in their situation or question? How much should that come from yourself as the expert reader? How do you know where to draw the line if the client is going to far astray? I’ve given Tarot readings to clients with all levels of skill with the cards, from the completely ignorant to the seasoned reader. I’ve also received readings from readers of various skill levels. Personally, I try to avoid interpreting the cards for myself when somebody else is reading for me, but it’s difficult to avoid. My opinion is that if you’re paying somebody to read the cards for you, you’ll get the best value for your money if you listen to what they’re saying. If you’re a student of the Tarot, the biggest benefit to getting a reading from somebody else is that every reader approaches the card in his own manner. A seasoned reader has a unique relationship with the cards. His interpretation of the symbolism is not going to be the same as yours. The value comes from a fresh, outside perspective. After all, if you are a client and a student of the cards, then you can always read them for yourself later. An exception to the rule is when you approach a reading as a conversation. You should be upfront with your reader beforehand, though. In this case, the client and the reader build a composite view of the reading. I’m not sure that it will offer the same insights, but it can be a great learning experience for both parties. I’m guilty of second-guessing readers when I’m the querant. It’s a fault that I’d really like to work on. For me to get the most out of a reading, I know that I need to spend more time listening. Letting the reader read means figuring out how to let go of control and accept information as it comes. That can be hard for a lot of people. Russell will be getting a free email reading, and you could, too, if you ask a question that I answer in this column! Feel free to email me or leave your question in the comments. This post is just marginally related to Tarot. Today I’d like to talk about Hermeticism and the Feast of Thoth. Hermeticism describes a poorly-understood school of mysticism from the early centuries of the Common Era. It arose in northern Egypt, around Alexandria, and was contemporary with the early Gnostics. 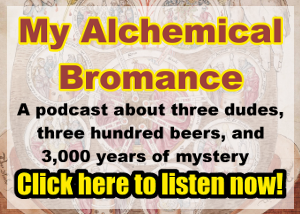 We don’t know a whole lot about the early Hermeticists. Their religion seems to have evolved from the ancient Egyptian religion. It definitely had an initiatic element and was deeply entangled in mysticism, gnosticism, and Neoplatonism. Most of the surviving literature from the movement can be found in a collection of short texts called the Corpus Hermeticum. The Corpus Hermeticum relates a series of lessons from teachers to students, beginning with the lessons of Hermes Trismegistus to his son Tat and his student Asclepius. In later books, Tat and Asclepius have become the teachers. Hermes teaches about the nature of the Cosmos and human consciousness. His lessons are profound, mystical, and sometimes obscure. The Sun is the 19th Major Arcana, and the third of the celestial Trumps.1 This is perhaps the happiest card in the Tarot, and indicates that things are going extremely well. 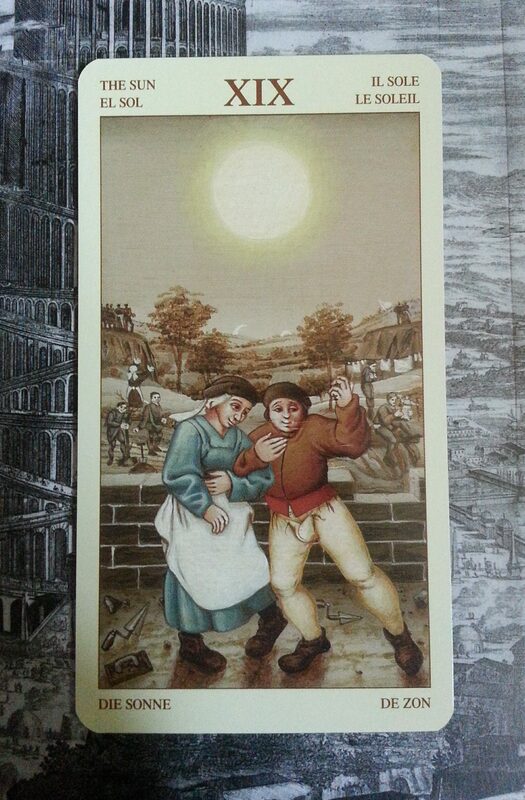 This week, I’m giving myself an additional challenge by looking at the Sun as depicted in a deck that’s brand new to me: the Bruegel Tarot. The Moon is one of those great mystery cards in the Major Arcana. In many decks, the imagery includes two hounds, water, towers, at least one moon, and a crustacean. It’s the second of the three celestial Trumps, between the Star and the Sun. Unlike the Star and the Sun, the Moon doesn’t create its own light. Though it shines, all of its light is reflected. Because it can only reflect light cast upon it, the Moon spends much of its time partially occluded. Light represents knowledge. If the light is hidden, so must knowledge be. Because of this, The Moon represents thoughts and ideas that we have hidden within ourselves. The water can indicate that the hidden things are lurking in our unconscious mind. The two dogs, usually one dark and one light, also symbolize two parts of ourselves. One is the part with which we’re familiar. The other is the darker half, or Shadow, which we must learn to face if we hope to grow as individuals. Different Tarot decks depict the Moon in different phases. In the Alchemical Tarot, the Moon is pictured as waxing, or increasing. 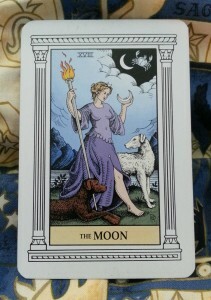 However, in the classic Rider-Waite deck, the moon is waning. One shows more light and the other less. Both, however, should remind us that our work at understanding ourselves is cyclical. At times, we feel as if everything is clear, and at times, nothing makes sense. Patience and reflection help us integrate more Light and knowledge when it is available, and help us understand the darkness while we wait for the Light to return.